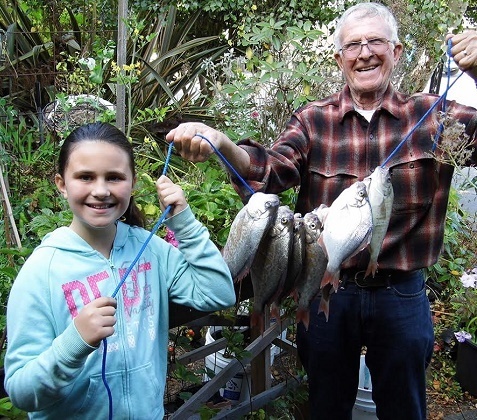 Bruce Amado, with the help of his granddaughter Sophia, shows off his limit of surfperch caught last Saturday at Table Bluff beach. In response to public recommendations from the Humboldt Area Saltwater Anglers and Humboldt County Board of Supervisors, the California Fish and Game Commission is proposing to restore the original location of the management boundary at Little River Beach for recreational razor clam digging. Currently, clams may be taken may be taken north of Strawberry Creek between Strawberry Creek and Moonstone Beach only in odd-numbered years, and south of Strawberry Creek between Strawberry Creek and Mad River only in even-numbered years. Due to a decline in larger clams, the razor clam management boundary line at Little River Beach was divided by Strawberry Creek in 1953 to split the beach into equal segments that could be fished in alternate years. Since this regulation has been on the books, Strawberry Creek has moved southward by 0.6 miles from its original location, resulting in a larger area in the northern section open for clamming during odd-numbered years. In even-numbered years, clammers now have a much longer walk to the southern management zone from the nearest parking lot, which is especially difficult for elderly and infirmed persons. The original location of the creek crossed the beach near where a county-maintained public parking lot exists today. The F&G Commission is proposing two regulation changes that would restore the original intent of the razor clam regulation pertaining to Little River Beach. 1) Replacing reference to the Strawberry Creek boundary with the boundary line due west from the county parking lot trailhead located at 40°59.67’ north latitude. The northern and southern boundaries would remain in regulation as Moonstone Beach and Mad River. 2) The regulation references Little River Beach near McKinleyville, however it is generally referred to by locals and on maps as Clam Beach. This name would also replace Little River Beach in regulations with the latter remaining in place parenthetically. The proposed regulation changes are intended to provide increased clamming opportunity in even-numbered years by increasing the size of the open southern Clam Beach management zone, thereby restoring the original intent of the regulation. Next up is the discussion hearing, which will take place Oct. 20 in Eureka followed by the adoption hearing on Dec. 8 in San Diego. It looks like nice ocean conditions will continue through the weekend. As of Wednesday, the forecast out 10 nautical miles for Friday is calling for winds out of the N 5 to 10 knots with swells to 5 feet at 10 seconds. Saturday looks similar, with winds from the N 5 to 10 knots and NW swells 4 feet at 7 seconds and W 4 feet at 16 seconds. Sunday the winds will be from the N 5 to 10 knots and N swells 3 feet at 6 seconds and NW 7 feet at 15 seconds. For an up-to-date weather forecast, visit weather.gov/eureka/. To monitor the latest Humboldt bar conditions, visit wrh.noaa.gov/eka/swan. You can also call the National Weather Service at 707-443-7062 or the office on Woodley Island at 707-443-6484. With decent weather predicted through the weekend, now’s the time to get back on the halibut grounds and take advantage of what’s left of the quota. The California Recreational Fisheries Survey has estimated that 23,806 pounds have been caught towards the 29,640-pound quota as of September 4. A few days of good fishing could bring an early close to the season. 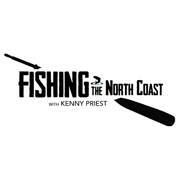 Tim Klassen of Reel Steel Sport Fishing ran south to the Cape for rockfish last Friday and Saturday and reports the days couldn’t have been more different. “On Friday, the south wind was blowing and the water was pretty choppy. The fish were really off the bite, we could see them suspended on the screen, but they didn’t want to bite. We did end up with limits of blacks, but everything else was hard to come by. Saturday was more back to normal. The south wind was gone and the fish were biting anything and everything. We landed limits of nice lings, blacks and rounded out the day with a variety of other rockfish. The next few days we’ll be drifting for halibut as the quota is getting close to being met,” Klassen added. The wind has been blowing, with Wednesday being the first day the rockfish boats were back on the water reports Leonard Carter of Crescent City’s Englund Marine. He said, “We’ve had a really windy season here, and it was the same story this week. There’s plenty of rockfish around, there just hasn’t been too many fishable days. When the boats can get out, it’s been really good,” Carter added. According to Mary Claire Kier, an Environmental Scientist on the Trinity River who manages the Willow Creek weir, quite a few fresh kings have made their way into the Trinity this past week. For the trapping week of Sept. 3 through 9, 70 king salmon passed through the weir. For the season, 132 kings have been counted. The total number of kings that passed through the weir in 2015 was 875. There’s fish in the river to be caught, but the bite has been off and on reports guide Mike Coopman of Mike Coopman’s Guide Service. “The fishing started off really good on Sunday, and has gotten a little slower each day. I’ve heard the mouth has been opening and closing again, so that’s not helping. But we’ve had plenty of opportunities each day, both on kings and steelhead. I’m sure there are plenty more fish to come,” Coopman added. : Where'd the salmon go?